EUR is under pressure because of the Eurozone poor economic data and today, there are no economic reports in the US due to the Labor Day Celebration. The support rests at 1.18700 with resistance at 1.1900 which both lines are below the weekly pivot point at 1.19180. The EMA of 10 is moving horizontally in the descendant channel but it is above the EMA of 100 and the EMA of 200. The RSI is moving on the 50 level, the Stochastic is showing upward momentum and the MACD indicator is in neutral territory. The ADX is showing buy signals. 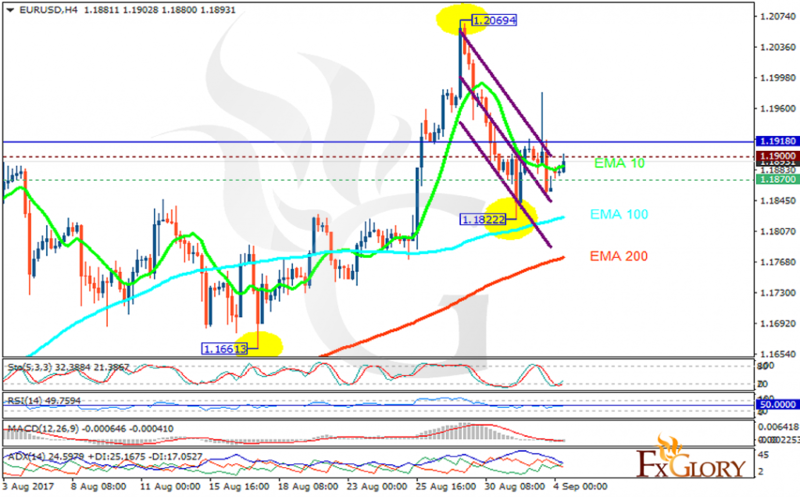 The indicators are no showing any clear signals therefore the pair will be fluctuating within 1.185 and 1.192 area.